At Mr. Picassohead, you can easily create art picasso paintings without the brush. 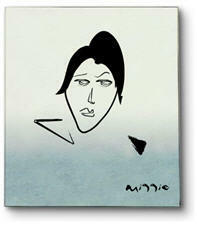 Mr. Picassohead is an online do-it-yourself portrait center for "painting" in the style of the abstract artist. Drag and drop Picasso elements onto a blank canvas. Choose from an assortment of faces, eyes, noses, lips, ears, eyebrows, hair, and abstracts, courtesy of Ruder Finn Interactive. There's also a Picasso font, so you can sign your name to your work. When you're finished, add your fabulous skewed face to The Mr. Picassohead Gallery and email it to friends. Guys, get your creative juices flowing. And don't forget to sign your masterpiece when you're done. Else someone may reproduce your "original" art.